Peter Schaefer only coached the Surrey Eagles of the British Columbia Hockey League for one season, but his impact lives on in the form of Boston Bruins rookie Danton Heinen. Former Ottawa Senators forward Peter Schaefer only coached the Surrey Eagles of the British Columbia Hockey League for one season, but his impact lives on in the form of Boston Bruins rookie Danton Heinen. Five years ago, Heinen was finishing up his junior B season for the 2012-13 Richmond Sockeyes. He only was 17, but he was considered a long shot to make it to the NHL back then. Most of his top-rated peers in his draft class were performing at higher levels in major junior, elite leagues in Europe, or the United States under-18 national team. Nevertheless, Schaefer liked the raw talent he saw in Heinen. So when the rookie coach - just a couple years removed from the conclusion of his pro career - took over the tier II junior Eagles, Schaefer made Heinen a personal project. Schaefer played in a combined 635 regular season and playoff games with Vancouver, Ottawa and Boston, and made a trip to the Stanley Cup Final with the 2006-07 Senators. He was known for his skating and two-way play, but, with the Brandon Wheat Kings, he checked in with 47 and 49 goals in his final two seasons of major junior. Schaefer also worked with Heinen on his hands, teaching him how to score from in close and how to make plays in tight confines. The hard work paid off as Heinen finished in the top 10 in league scoring with 29 goals and 62 points in 57 games. His play earned him a scholarship to the University of Denver and he was drafted in the fourth round (116th overall) by the Boston Bruins that June. Heinen didn’t know what to expect when the 2014 draft rolled around. He decided not to attend the week-long proceedings in Philadelphia. Instead, he already had moved to Denver so he could begin school early and take some summer courses. On the second day of the draft, he would occasionally check online to see if his name was called, but he missed the moment the Bruins called his name in the fourth round. His parents, however, were closely following the draft and they were quick to call their son to let him know the good news. Thanks to Schaefer’s tutelage, Heinen was on his way. Heinen was too young to recall Schaefer’s first few seasons with the Canucks. But growing up in nearby Langley, B.C., Heinen was an ardent Canucks fan. He attended a handful of games every season because the company his father worked for had season tickets. 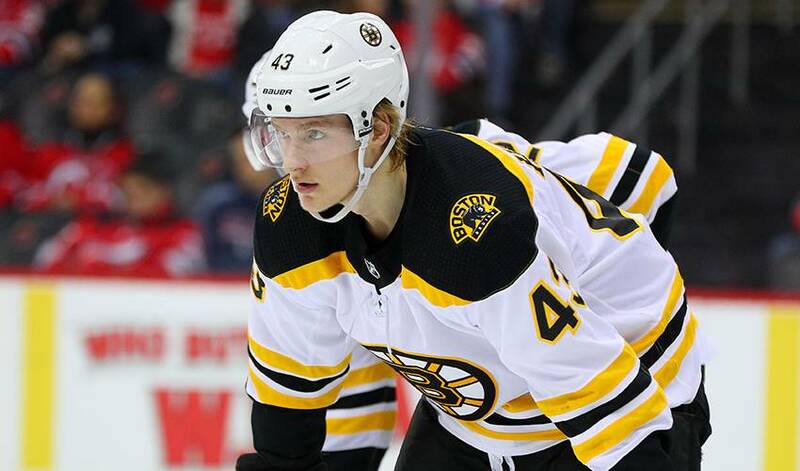 Now here Heinen is, seven years later, playing forward for the soaring Bruins, the team that dashed the hopes of so many youngsters like Heinen in Vancouver not long ago and that has become a Stanley Cup contender this season. Has he convinced any of his friends back home to cheer for the detested Bruins?